Ana visits much earlier than usual. Me: "I'm not used to seeing you this early. I haven't even awakened to the day yet." An overweight black woman walks into the restaurant with two energetic pre-teens. 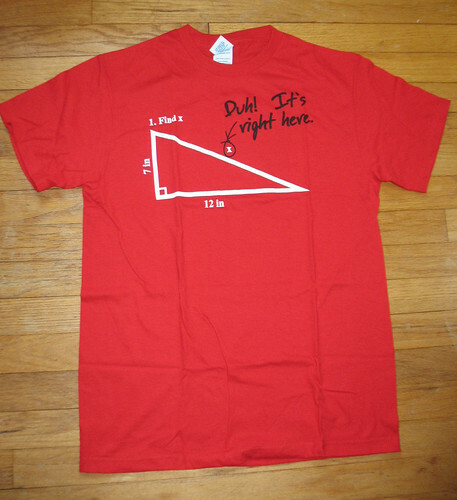 She's wearing a red t-shirt with a geometry equation of a right-triangle missing x. It says "Find x" and then with a marker circles the x on the triangle saying, "Duh! It's right here!" After I write down her order and ring her up I ask, "Do you know the real answer to that?" With a surprised and confused look she responds, "Nah." That's the exact kind of mentality that American pop culture promotes: comedic ignorance. Now I may not be brushed up on my geometry – I think it's been over a decade now since I've solved an equation like that – but if I was going to wear a shirt like that I'd at least know the answer to x. Then again, if I were the kind of person that would be wearing a t-shirt like that I probably wouldn't care. Now maybe I'm being too judgmental – and of course I didn't share my observation with the woman – but it still represents something on a grander scale. If only everybody remembered the Pythagorean theorem this world might have a flicker of hope. The deliveries become steady in the afternoon and there's no time window for me to make food. Ana saves the day by preparing a sandwich for me at the house so I can just drop by and grab it. She's a lifesaver, or should I say a lunch-saver. Egg Sandwich with Beet Hummus and Tomato. Blue Quinoa Corn Chips. Honey Green Tea. Getting through the long drives with mystery podcasts. 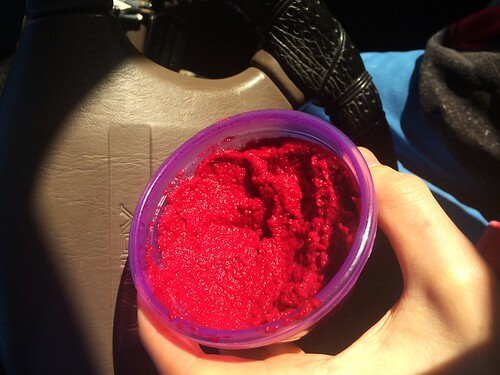 Raw Protein Drink. Honey Crisp Apple. Vegetable Soup in a Ginger Chicken Broth. Broccoli and Rice. Siggi's Strawberry Yogurt.